The latest series to come from the Marvel universe hits Hulu’s platform today with the adaptation of the 2003 comic book series, Runaways. Superhero series follows a group of young teenagers that are discovering their superhuman abilities while they uncover hidden secrets from their parents. 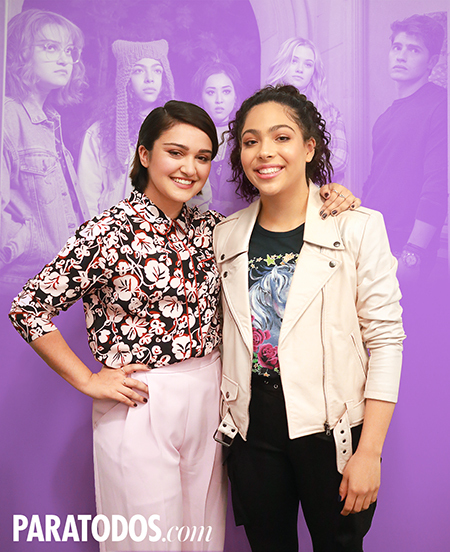 The series includes two Latina actresses, Ariela Barer as Gert Yorkes and Allegra Acosta as Molly Hernandez that join forces with their high school friends after discovering they share a connection through the mysteries their parents leave for them to unravel. We caught up with the two leading ladies from the cast at the Hulu offices in Los Angeles, California to chat about what they love about their characters, becoming superheroes and joining the Marvel universe. Don’t miss the latest episodes from Marvel’s Runaways streaming now on Hulu.